There’s a lot out there, some good, some bad. Back up your computer. Back up all your files. All the time. That’s good advice. It comes from every writer friend I have. Recently I learned what truly excellent advice that is. Someday I’ll regain enough emotional stability to talk about it without twitching like a frantic Deputy Barney Fife. Friends sometimes give bad advice, however. The one who told me I had to outline every scene before I began my manuscript had me stalled for months. The method worked for her but tied me up in knots. Don’t worry–he won’t recognize himself. If you’re interested in writing. you’ve no doubt browsed the section of the bookstore or library for books about how to write. Shelves are packed with them. I’ve bought them for years, compulsively. Some have helped me, but some–not so much. >You must outline before writing. >You must get up an hour early to write before you go to work. >You must write for a set time every single day. Even days when you sleep through the alarm, and the boss makes you stay late, and you get home and have to cook dinner, and then your five children tell you they promised you would make homemade brownies for their class Halloween parties, and the sixth says she’s given away her mermaid costume because now she wants to be a duck, and the stores don’t have any duck costumes, and you couldn’t make that child look like a duck if your life depended on it. And your husband is working in the Azores and won’t be home till Thanksgiving. >And my #1 favorite: You must describe each scene of your projected novel on a 3″ x 5″ note card, and stack the cards in sequence, before you begin the manuscript. At any point, you may stack them in a different order, but you must never jump ahead and write a scene out of sequence, before you’ve written the scenes before it. That Very Specific Commandment appeared in a book by a prominent author and teacher, so I thought I had to obey. For months I kept the paper companies in business by buying note cards, describing scenes, becoming seasick every time I tried to write, throwing the cards away–and buying new cards. I recently read the author now uses popular software when he composes. He didn’t mention note cards. As I said before, some advice is good, and some isn’t. Each writer gets to decide for himself which is which, to find his own process and establish his own rules. We’re all different. For that reason, the books I like are primarily descriptive rather than prescriptive, not How to but How I… Books in which authors tell stories about their own experiences, success and failures, methods, and beliefs about the writing life. If they slip in some How to…, it’s usually worth considering. Perhaps the best-known and -loved of his genre is Anne Lamott’s Bird by Bird, a humorous and heartfelt memoir of her development as a writer and as a human being. Stephen King’s On Writing is another, a story of persistence crowned by his wife’s pulling the manuscript of Carrie out of the wastebasket and insisting he continue trying to get it published. But there are other fine books that, though not so well known, are worth anyone’s time and attention. The first came to my notice for a Story Circle challenge: Write and post a four-sentence book review. 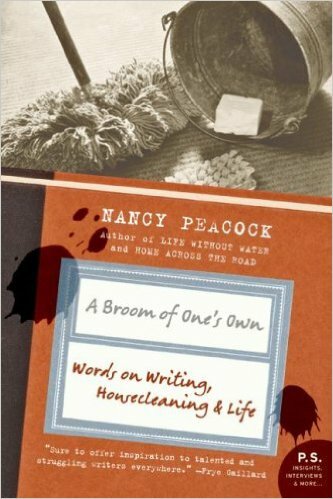 I chose a review copy of Nancy Peacock’s A Broom of One’s Own: Words on Writing, Housecleaning, & Life. From cleaning the houses of a variety of clients, Peacock extracts truths about about writing. Below is my original review. “I like Nancy Peacock’s A Broom of One’s Own: Words About Writing, Housecleaning & Life so much that it’s taken me over two months and two missed deadlines to untangle my thoughts and write this four-sentence review, an irony Peacock, author of two critically acclaimed novels, would no doubt address were I in one of her writing classes. 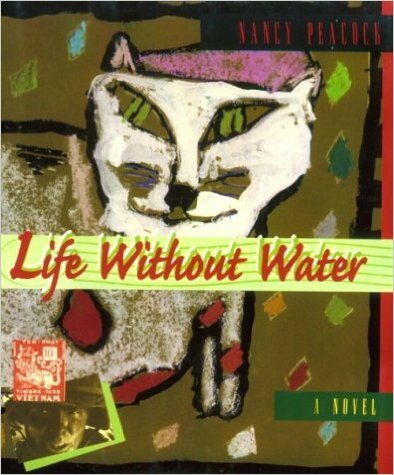 “She would probably tell me there is no perfect writing life; that her job as a part-time house cleaner, begun when full-time writing wouldn’t pay the bills, afforded time, solitude, and the “foundation of regular work” she needed; that engaging in physical labor allowed her unconscious mind to “kick into gear,” so she became not the writer but the “receiver” of her stories. In its own way, A Broom of One’s Own is as amusing as Bird by Bird. Much humor comes from Peacock’s description of her relationship with clients and of their idiosyncrasies. I planned to review three books readers might like as much as I do, but I’ve run on long enough. The authors whose advice I respect most are ones like Peacock: kind, thoughtful, understanding, honest, and generous, willing to share what they know and to admit they don’t know it all. and at Writing Wranglers & Warriors. to the library she directed. She wishes she had them back.